At some point in the second volume of Game of Thrones, one member of the Night-Watch, a guild of toughened rangers, makes the following observation: “If it’s softer than the ground and it has a roof on its head I call that a bed”. I agree, but still, modern fluffy beds are a blast! After a good night at Donna and John’s we were ready for the day, which, wonderfully enough, started with a real American breakfast courtesy of John. At this occasion I was introduced to the concept of Hash Browns and it was wonderful! Together with crispy bacon and slightly runny eggs, it could not have been better! The delicious grape jelly (I didn’t know one could use grapes for something else than making wine…) was also a perfect addition to the toast! All in all, a delicious breakfast I wish I could afford every day. 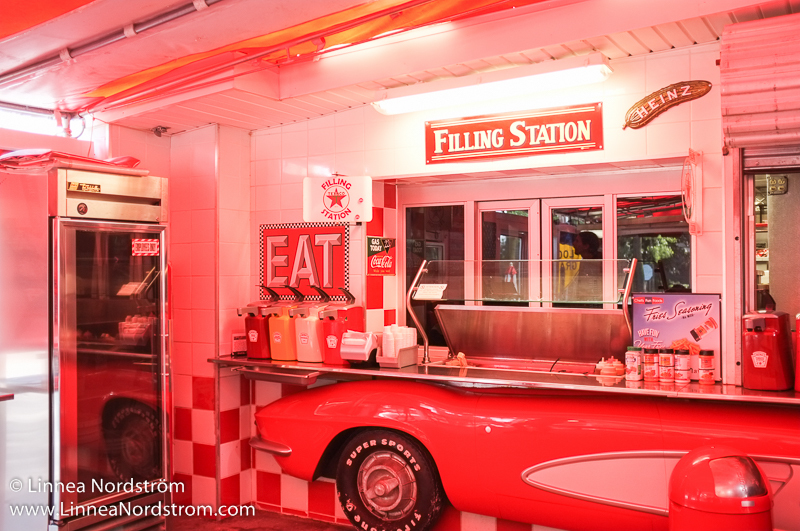 The diner was decorated with parts of cars and various retro signs. The plan for the day was for Maggie to pick us up and take us to Erie. She did so and we started the ride by visiting Jaeme, a craftswoman/druid/photographer who also happens to be Mo’s roommate (or rather the other way around). It was a nice visit and there were many, many cats. Jaeme is a fun person and she showed us her garden which barely falls short of being described as extremely luxuriant. 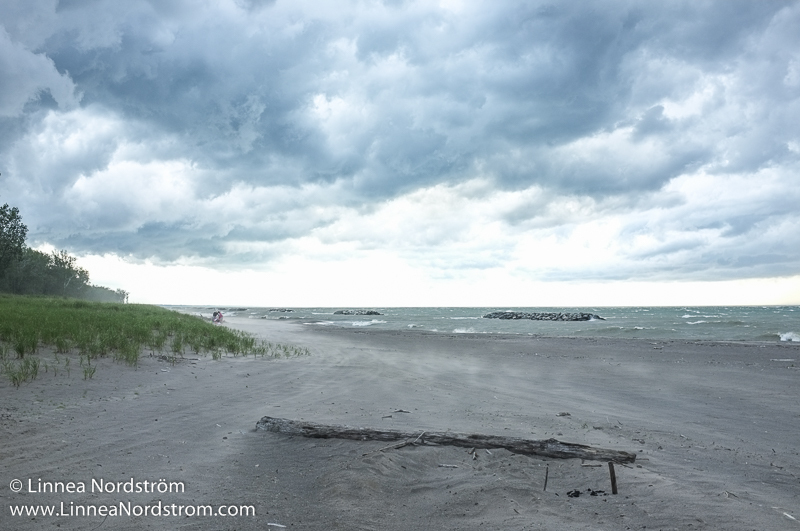 There was obviously a storm brewing on Lake Erie when we visited Presque Isle. 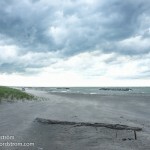 After that we went to Presque Isle, a beautiful park by the shore of Lake Erie. Once there, we started of course, by eating lots of fatty food at a local dinner. 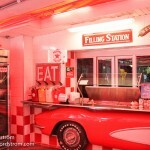 The place couldn’t have been more “American”, god just look at the pictures! It only lacked an altar to the glory of the mighty Bald Eagle to make the place perfect. At this glorious place, I had the pleasure to eat weirdly-shaped fries and a “Foot-long hot-dog” which was, after closer examination, not really a full foot long. T’was tasty though. 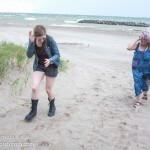 Linnea and Maggie being aggressively exfoliated by flying grains of sand at the beach. 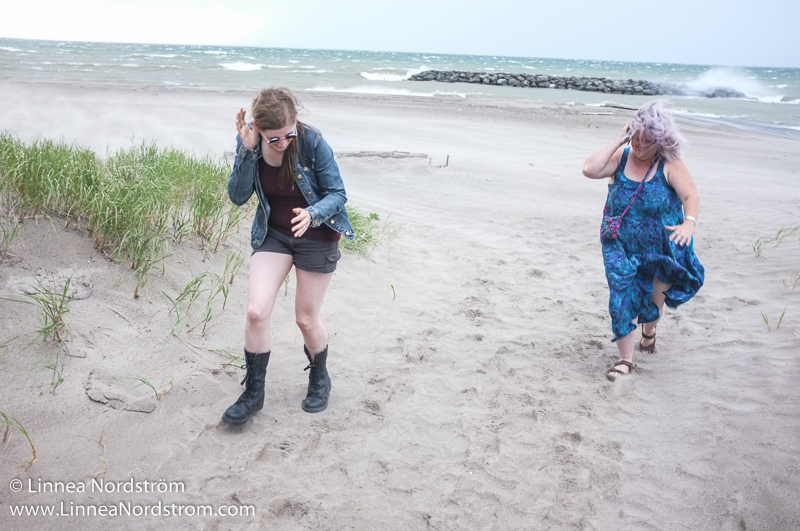 After that we went to the actual park of Presque Isle where we learned the importance of Erie harbor during the British-American war of 1814 and got exfoliated by a sandstorm on the beach. Nothing odd or unusual as you can guess. 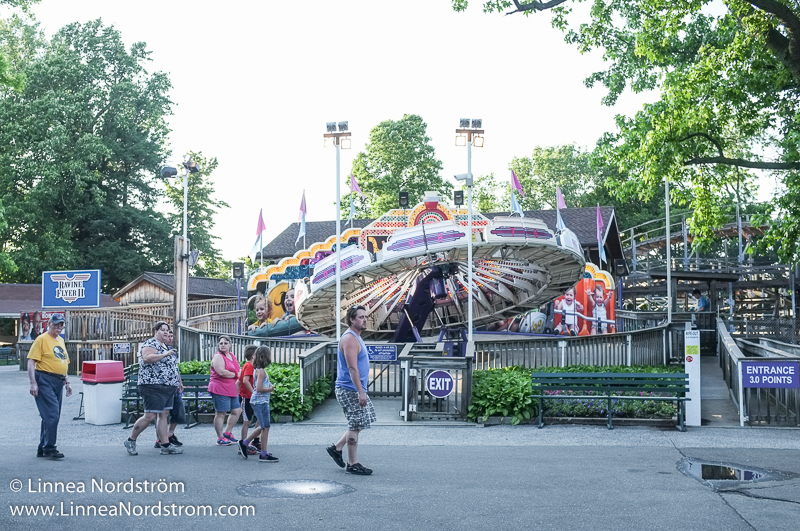 Then came the real highlight of the day: a visit to Waldameer amusement park! 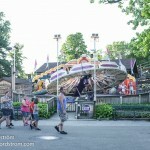 Waldameer has fast roller coasters and spinning rides. Having never been to any real amusement park before you can guess I was really excited. Linnea had chosen the place because she used to go there when she was a kid. God, I envy her childhood because it was so much fun! We went on so many rides I almost lost my innards on a couple occasions! 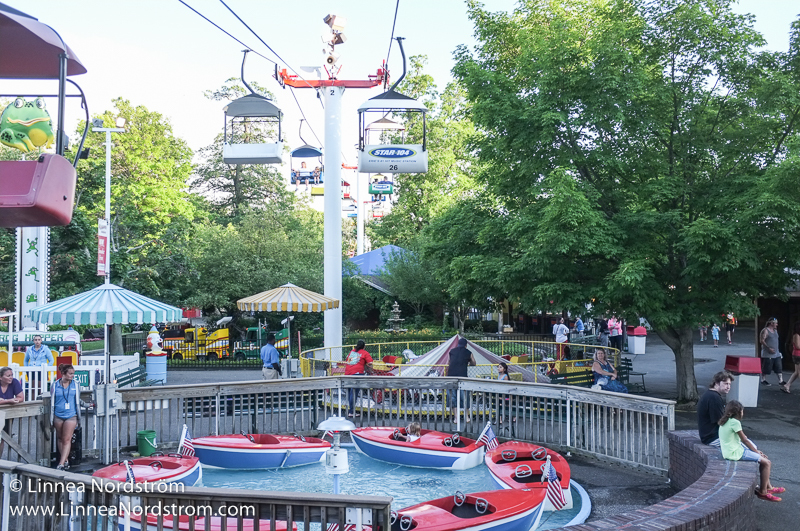 We took a little train ride around the park too, a water-log tour, a cable-car tour… I was overjoyed when I saw that there was a Whack-a-Mole game (I had only seen it in comic books before!) and I ended up winning a teddy bear that I gave to Linnea. At the age of almost 25 I finally had the occasion to win a plush-toy for my girlfriend. I felt proud. And grown-up. 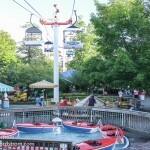 As well as more gentle rides such as the Sky Ride aka “The Buckets” and rides for kids. Anyway, I cannot possibly list everything we did at the park, I can just say that it was pure bliss. For some reason, there weren’t so many people there either so it was also very easy to get to the rides we wanted to try. We spent the whole afternoon there until closing time (10, P.M.) and then headed to the station. We had a train to take at one in the morning and we didn’t want to be late…or did we? Copyright © 2019 LinneaNordstrom.com All rights reserved.